Steve Robinson - Author: My story so far - part 3. My story so far - part 3. We've caught up to the third quarter of 2011 now, and with In the Blood published, my thoughts turned to my second Jefferson Tayte book, To the Grave. Because my agent at the time was unable to secure a deal with a mainstream publisher, I knew had to write something a little different to have any chance of success the second time around, as I couldn’t see the sense in offering more of the same when the first book hadn’t worked out. 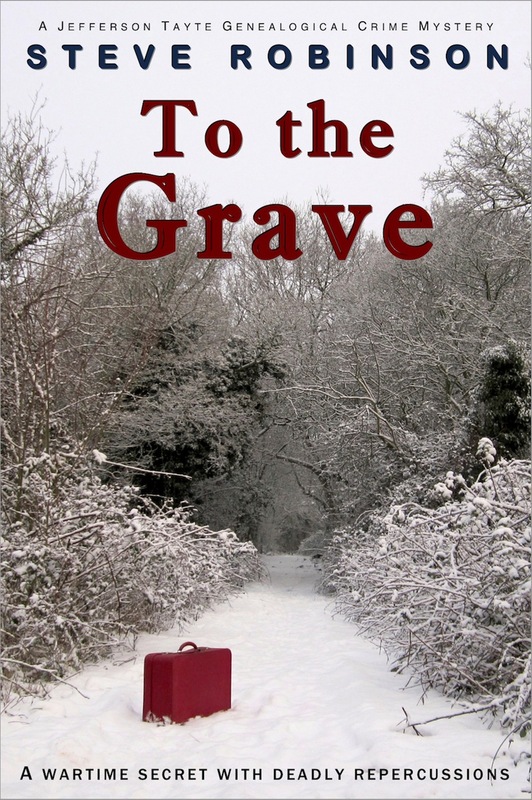 To the Grave differs then from In the Blood in that the past narrative is told entirely from a single point of view and it‘s as much about the past story of what happened to Mena Lasseter and why, as it is about Jefferson Tayte’s struggle to find her. Originally, I had also written a present-day narrative that tried to settle JT in Cornwall, which didn’t work very well, and I’ve since thought it would have been a big mistake as it would have limited his assignments. When looking at the book again, I also felt that it didn’t really sit alongside In the Blood as well as it needed to, since In the Blood’s publication had set the precedence for the rest of the series: a past mystery with a present-day thriller. So, I had about 40,000 words I could use from the past narrative, and I decided to write a whole new storyline for JT to include the thriller elements present in In the Blood. When I look at the two versions of To the Grave now, they are like night and day and I’m very glad I didn’t stick with what I had. When you’re working by yourself with only your instincts to guide you, I think it can be very difficult to know what to do and to feel confident about it. I’m very glad I trusted my instincts and didn’t take the easy route of releasing the book as it was originally written. ‘Kill your darlings’ is a phrase often cited in writing circles and that was never more true for me than when it came to editing To the Grave for publication. It took me about eight months to get it ready, and it was released one year after In the Blood in June 2012. During that time I really enjoyed all the reader interaction from chatting on the Kindle forums and on Twitter (and I still do), and I also built a garden office so I could feel like I was going out to work each day and would have somewhere with a proper chair and desk to sit at. The reality has since proven a little different to my expectations though, as most months since I finished building it have been too cold, and I shudder to think what it would have cost to heat it up and keep it warm every day. So, I still write in bed and at the kitchen table, although it’s summer now and I’m happy to report that I’m in my writers’ cabin, writing this blog. Here are some photos. This was taken just after the build in 2011. Lovely cushion for the cabin sofa. Thanks Sarah! The story of the little red suitcase and my serendipitous jacket cover. If ever something was meant to be then I believe it was the cover for To the Grave. While I’m writing a book I often wonder about the cover as I go along, and that gets more and more important as the publication date draws closer. I produce my book covers myself from photographs I take, either on research trips, as with In the Blood, or on specific cover shoots, as with To the Grave and The Last Queen of England. 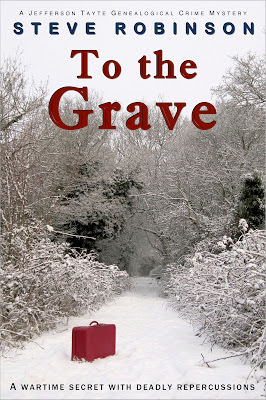 For To the Grave’s cover, I decided I wanted to depict a scene from the book which involved Mena’s red suitcase and a snowy country lane. It was winter by the time I finished the first draft, but I didn’t hold much hope of getting snow right when I wanted it, so I focused on the suitcase, hoping to find one from the 1940s so it would look authentic. This is where the serendipity part comes in because I went on eBay and there was a small, 1940s red suitcase for sale that looked just how I imagined Mena’s suitcase to be. So I bid on it and I won the bid, which was lucky in itself. It arrived a few days later and a day or so after that it snowed quite heavily in the night. I couldn’t believe my luck. It was a bright, sunny morning and at about 07:30 I ran to the lane at the bottom of the road where I live, with my camera in one hand and Mena’s suitcase in the other, and I took the shots for the cover before the snow got trampled or turned to slush. And as if by magic To the Grave had a cover. In part 4 I’ll let you know all about the dark turn my third book originally took, and about the challenges and concerns I faced with the rewrite - as well as a few things that got me really excited earlier this year. Having to write a whole new storyline can't have been an easy decision but I'm glad it worked out so well for you. 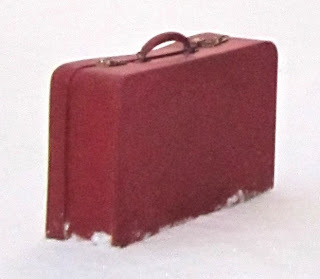 What a great choice to buy the suitcase and create a cover using it in the snow as you have. It's quite stunning and leaves many questions unanswered as to why it's there. What a great way to draw people in. All the best with your writing. Thanks David. I thought the cover would add to the mystery element. Originally I wanted to have Mena in the scene, standing by her suitcase and looking down the lane. I think that would have been good, too, but having no one in the scene might make you ask where the owner is, which is such an key question in the story as that what Jefferson Tayte has to find out. I love hearing backstory like this! I came to your books through BookBub--first To The Grave, which I couldn't put down so I then immediately downloaded In the Blood when I finished. I'm partway through it now and am hoping to save The Last Queen of England for when I'm on vacation next week but am wondering now if I can pace myself to hold out! They're wonderful books, and I'm also able to share them with my 81-year-old dad, which is a bonus. I'm so glad you have plans to write many in the series--nothing more disappointing than finding a great new author, only to hear they plan to write only one more! Best wishes! What a lot of nice things to say. Thank you! :o) It's great that you're sharing them with your dad and I feel very honoured that you regard them highly enough to do so. I promise to keep to writing them as long as you'll keep reading them. Hope you like The Last Queen of England when you get to it, which sounds like it will be soon. Do let me know what you think. New feature at The Family Curator. Something to consider for your author toolkit. My story so far - part 4.